The nervous system processes information throughout the body by carrying signals between the central nervous system (CNS) and peripheral nervous system (PNS). 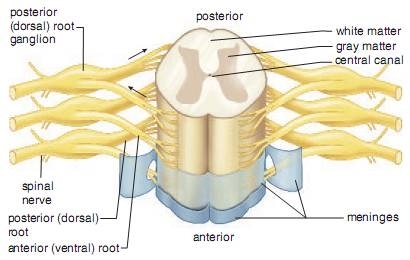 The CNS is composed of the brain and spinal cord, while the PNS consists of nerves which are connected to the CNS and reach the rest of the body. 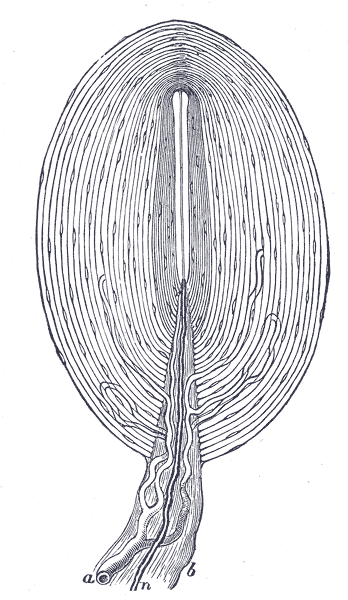 The spinal cord consists of a central canal filled with cerebrospinal fluid, and grey (H shape) and white matter. Nerves connect to the cord, while the meninges act to protect the cord (alongside the brain). The brain has several key parts: the medulla oblongata, the cerebellum, the cerebrum and the hypothalamus. The cerebrum is the uppermost part of the brain that contains many different lobes that control various voluntary functions such as speech, movement and thought. The hypothalamus includes the anterior pituitary gland, the master gland which secretes different hormones key in metabolism and reproduction, and functions in many systems to regulate sleep, hunger, parental attachment, etc. Its functions include temperature regulation and osmoregulation (blood homeostasis by the kidney). 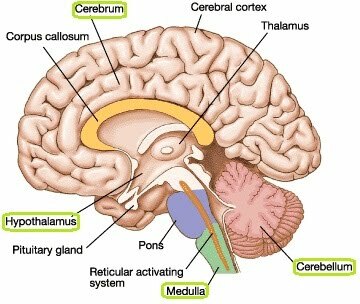 The cerebellum (“little brain”) controls how movement is executed, although not its initiation. This includes timing of movements, precision, coordination, fine movements and posture. 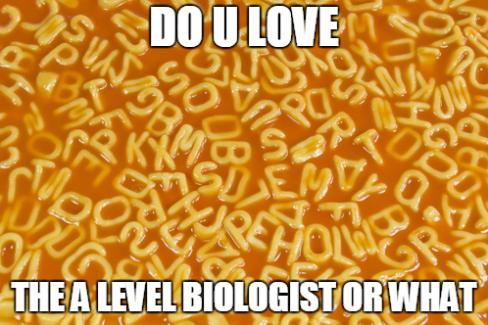 It may also have functions in cognition such as attention and language. The medulla oblongata is a key part of the brain whose function lies in controlling many autonomous functions including breathing, heart rate, vomiting, blood pressure control, coughing, sneezing and swallowing. As hinted previously, some functions are voluntary and some are autonomic. This is because the PNS is split into voluntary and autonomous systems. Furthermore, the autonomous system is split into sympathetic and parasympathetic, the two acting antagonistically depending on the situation. They act on all body systems to spark alertness (fight or flight response) in the case of the sympathetic system, or the opposite (rest and digest) by the parasympathetic system. This acts on the pupils (dilation), the respiratory system, circulation, digestion, blood glucose, stress, excretion, etc. 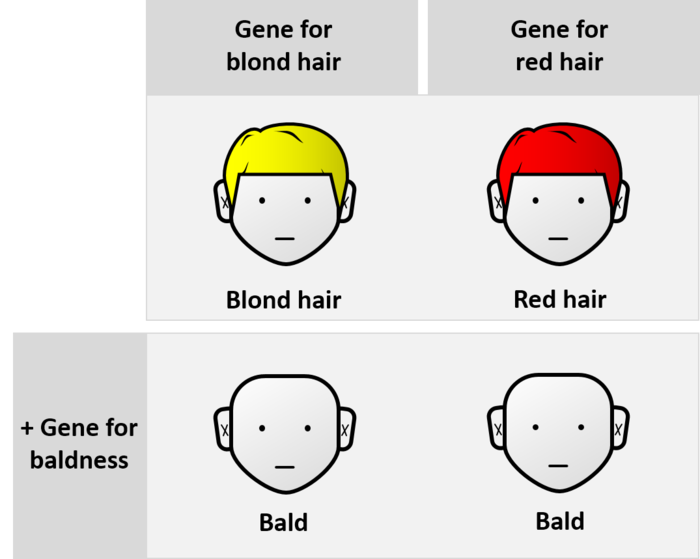 The sympathetic system relies on the secretion of noradrenaline in response to stress, which binds adrenergic receptors to elicit response from the aforementioned systems. Pupils dilate, respiratory rate and heart rate increase, blood pressure increases, digestion is inhibited, etc. 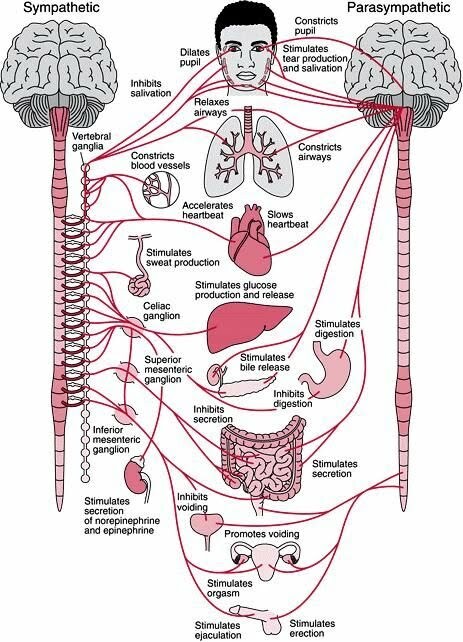 Conversely, the parasympathetic system relies on the neurotransmitter acetylcholine and results in increased digestion, lowered heart rate and blood pressure, glucose storage as glycogen, sexual arousal, excretion, etc.